The heavy rain and snow of recent months abated in January, leaving us slightly wet and warm overall. While it has been a wet winter, can we blame El Niño? Make sure to check out our global pattern update. After our wettest December on record, nearly everyone in North Carolina seemed ready for a break from that soggy weather. 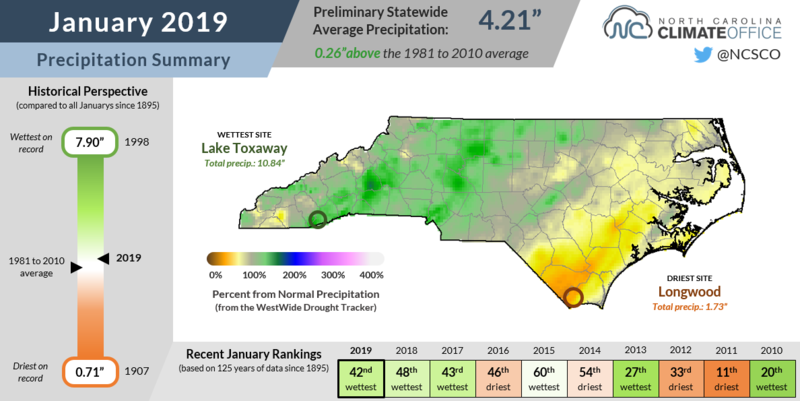 While January still saw above-normal precipitation -- the statewide average of 4.21 inches ranks as the 42nd-wettest January in the past 125 years -- we were far from record-setting territory to begin 2019. The wettest spots were in the western half of the state, including at Lake Toxaway, which reported 10.84 inches last month. In Marion, the monthly total of 7.26 inches ranked as the 5th-wettest January in the past 108 years. Elsewhere, though, conditions weren't so wet as the moisture-rich storm track to our south and off our coast wasn't quite as active. In fact, many parts of eastern North Carolina finished the month a bit drier than normal. In the southern Coastal Plain, Florence-soaked areas such as Lumberton, Whiteville, and Wilmington were all 1 to 2 inches below their normal January precipitation. Despite that dry weather in a few spots, we're far from having any concerns about drought. 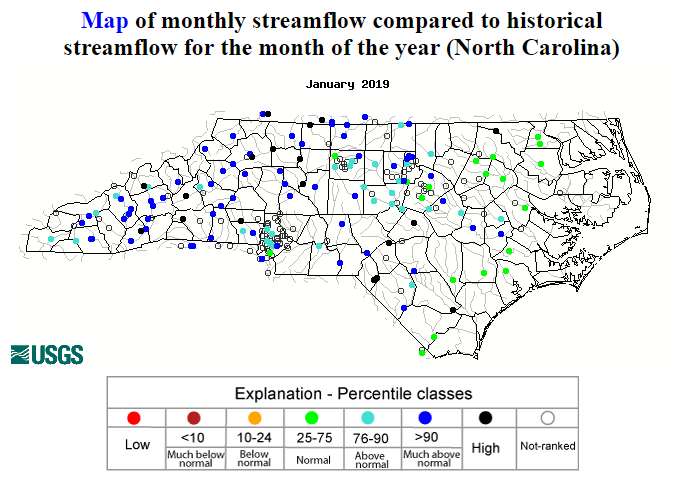 Streamflows remain near or above normal statewide, and soil moisture conditions were still relatively wet at the end of the month. Although January is climatologically our busiest month of the season for wintry weather, we made it through last month with little snow outside of the Mountains and a quarter-inch of freezing rain accumulation in the Triad on January 13. We started last month with highs in the 70s and finished with a glancing blow from the polar vortex. 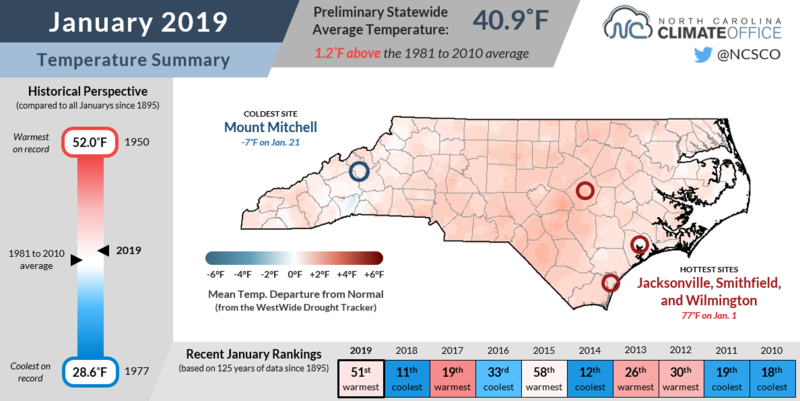 In between, it was largely a mild month, and the preliminary statewide average temperature of 40.89°F ranks as our 51st-warmest January since 1985. The monthly average mean temperatures were generally 1 to 4 degrees above normal. In the Mountains, overnight lows were up to 7 degrees above normal in Marion, but daytime highs were a bit cooler than normal due to persistent cloud cover. 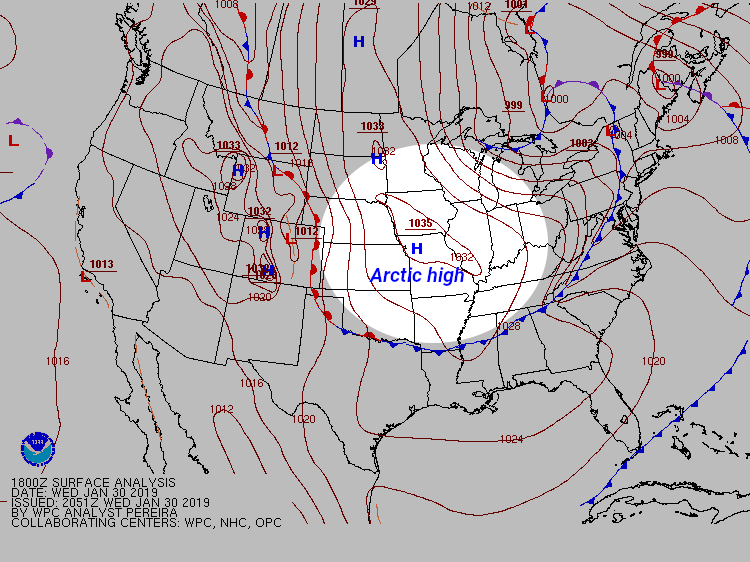 Although much of the country saw a cold air outbreak late in the month associated with a piece of the weakened polar vortex moving southward, that Arctic high pressure system largely stayed off to our northwest. We did cool down with highs only in the 30s on the last day of the month, but that was a far cry from the sub-zero temperatures that the upper Midwest experienced. So how does this January compare to those in recent years? It was quite a contrast to our chilly start to 2018; this year, highs hit the upper 70s across parts of the Coastal Plain on New Year's Day! January 2017 was a bit warmer overall, due largely to a substantial stretch of above-freezing days. By comparison, our nighttime lows last month regularly dipped down into the 20s and upper 30s. The closest recent analog to last month may be January 2015. Average temperatures were also slightly warmer than normal that month with only one notable cold air outbreak. It was also a month largely absent of wintry weather. For what it's worth, that month was followed by a particularly cold and snowy February. So will history repeat itself this year? Through December and January, we're on track for a wet winter with average temperatures slightly above normal, but one part of this winter hasn't played out like we expected. In our winter outlook blog posts from November, we noted that we had begun to see some atmospheric impacts of the late-emerging El Niño event, which gave us more confidence that the connections between the ocean and atmosphere were becoming coupled and therefore more likely to affect our weather. Recent sea surface temperature anomalies show a decrease in warm anomalies in the central Pacific. (Image by the NWS Climate Prediction Center). Our wet December even seemed to prove that was happening. However, not everything along the equator is as it seems. Warm water remains near the surface in the western Pacific, but sea surface temperature anomalies in the central and eastern Pacific decreased to near-normal levels in January. We also haven't seen a continued slackening of the easterly trade winds over that region, nor an eastward expansion of negative outgoing longwave radiation anomalies that would hint at the growth of typical El Niño-induced convection or thunderstorm activity. Because of that, El Niño may not be having much of an impact at this point in the winter. 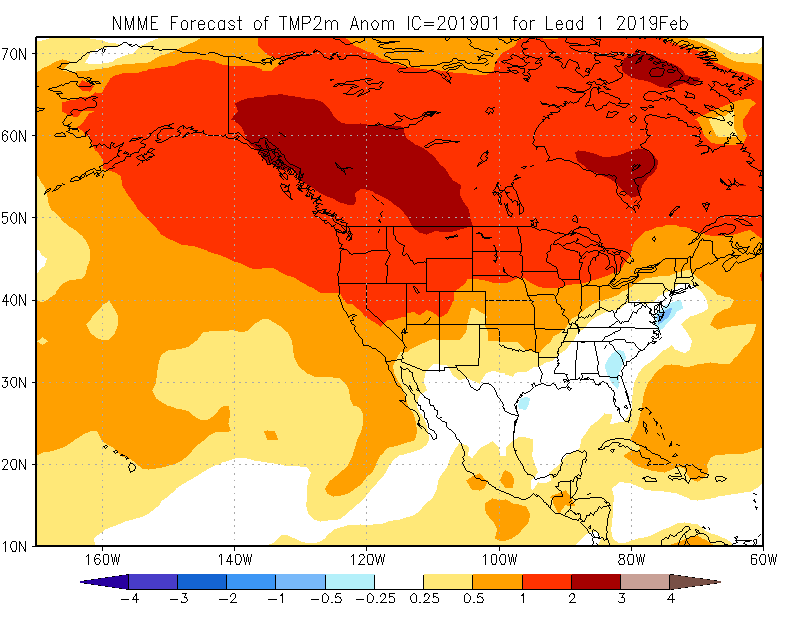 As the Climate Prediction Center's latest discussion notes, "this lack of coupling has interfered with the typical maturation process of a developing El Niño... The combined effect of the ocean-atmosphere system is more consistent with ENSO-neutral than it is with El Niño." In ENSO-neutral years, our weather is often dictated more by other atmospheric patterns such as the polar vortex. This winter, another feature, which has been rarely discussed on the Climate Blog, has also been in play: the Madden-Julian Oscillation, or MJO. NOAA's ENSO Blog has a far more thorough description, but in summary, the MJO describes the cyclical global movement of enhanced convection in the tropics, which like ENSO can affect weather patterns at our location in the mid-latitudes. The MJO is often described by which of eight phases it's in corresponding to the location of that enhanced convection, and a number of those phases have distinct impacts on North Carolina. In early January, that convection moved into the western Pacific (phases 6 and phase 7), which tends to be linked with warm and dry wintertime weather for us. 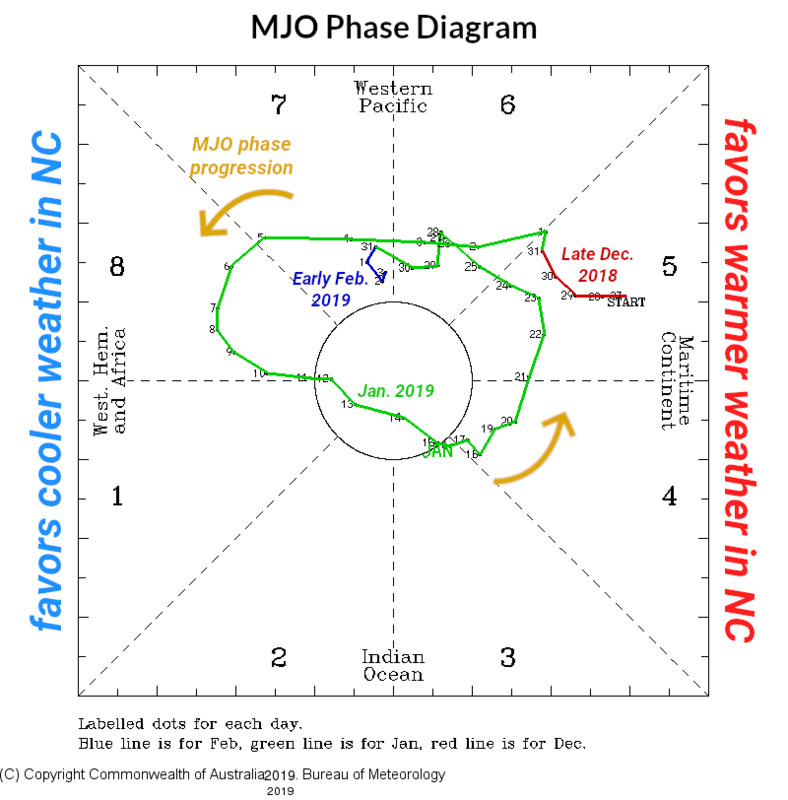 The MJO then moved into phase 8 -- associated with enhanced convection over the central Pacific, similar to where it would be in a typical El Niño pattern -- and it often has similar impacts on North Carolina, such as cooler and sometimes wetter weather. In mid-January, we did indeed have a minor wintry event as the MJO transitioned back to a neutral phase marked by limited tropical convective activity. During the second half of January, tropical convection fired up over the Indian Ocean -- MJO phases 4, 5, and 6 -- which is linked with warmer weather in North Carolina. As that convection moves over the Pacific once again, the MJO is now re-entering phase 7, and our weather forecast reflects that, with warm weather likely in the first 1 to 2 weeks of February. 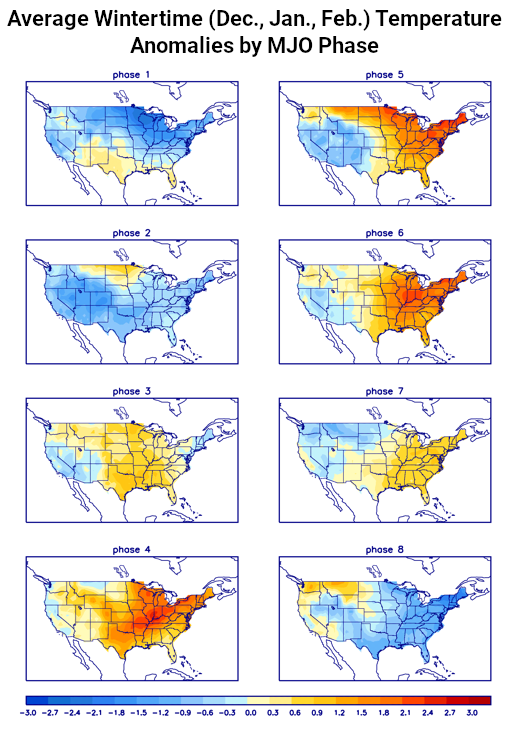 After that, though, forecasts show the MJO reaching phase 8 -- our sweet spot for cool, wintry weather. That's no guarantee for snow, of course; an uncooperative polar jet stream could leave us too warm even if moisture moves in from the south. 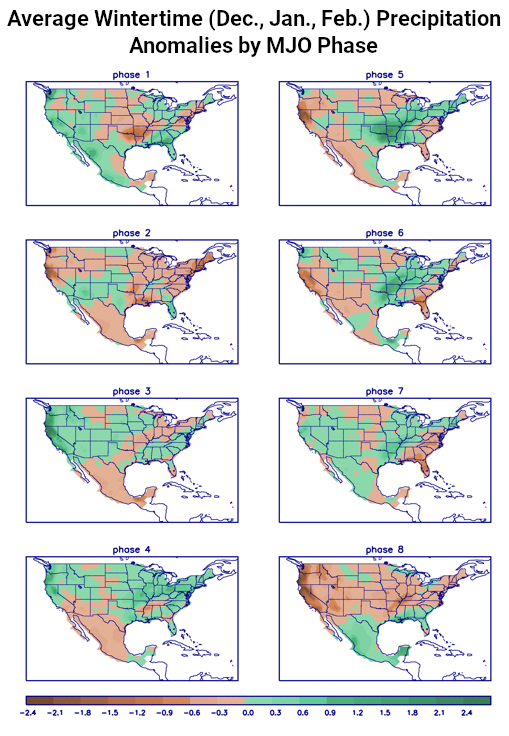 The North American Multi-Model Ensemble -- a collection of several longer-range climate forecast models -- does show near-normal or slightly cooler-than-normal temperatures in February for much of the southeast, along with above-normal precipitation just to our south. 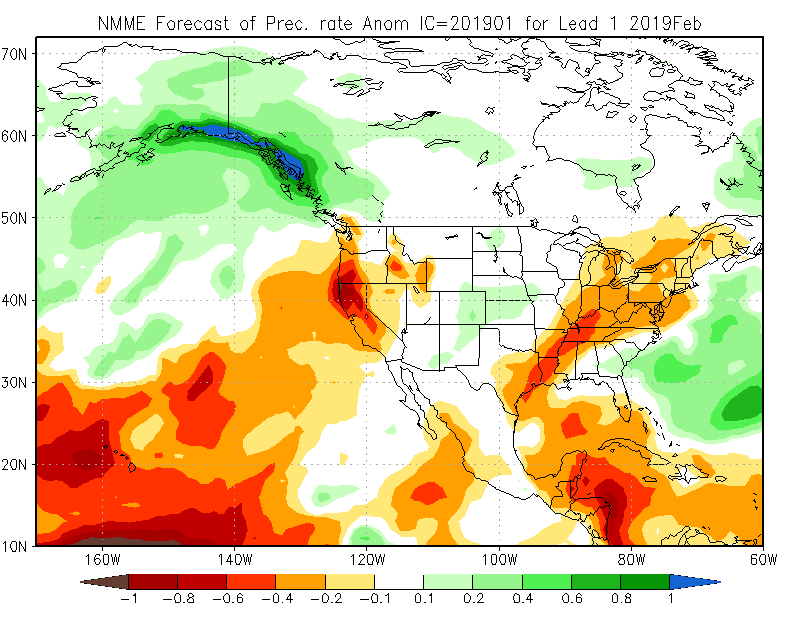 It may not be a classic El Niño pattern, but in this winter where the ocean and atmosphere in the Pacific can't quite get on the same page, the MJO could provide our best chances for late-season snow.